Create More Living Space for Your Lake Norman or Mooresville, NC Home with Home Additions! Home Additions in Mooresville & Lake Norman – If you’re like most homeowners, you’d probably much rather play Tetris on the computer or on your cell phone than play it out in the dark, cold shed or garage with your storage boxes. And wouldn’t it be great to have more space for your kids to play when it’s too hot or cold to go outside, to have your own home gym or entertainment room, or to not have to hang sheets in the middle of a shared bedroom to prevent your teenage girls from fighting over what’s on “my side” of the room? The answer to all of these problems is home additions! At Chad Goodin Signature Homes, we are dedicated to making the dreams you have for your home a reality. For over 30 years, we have been helping our customers by renovating, building and creating home additions in order to make the space you need by using your idea and creating a plan that fits your vision and needs. Located in Mooresville, North Carolina and serving the entire Lake Norman area, we can create home additions that will serve as playrooms, extra bedrooms, storage rooms, home gyms, entertainment rooms, office spaces, larger kitchens, and much more. We make the project quick and easy for you, work from your ideas, and keep constant communication as the project progresses. Watch as your home expands, and you’ll feel relieved as you move things into that new space. 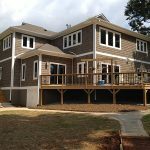 We always build home additions to your satisfaction. Our expert designers, professional craftsmanship, and well-trained crew will listen, give options and ideas, create and execute the perfect plan for you. For more information on home additions, contact us today! At Chad Goodin Signature Homes, we can build beautiful home additions in Mooresville, Cornelius, Davidson, Huntersville and the surrounding Lake Norman area of North Carolina.